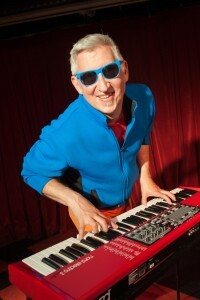 Rhode Island celebrity Keith Munslow is easily one of the most talented musicians in our community. Not only does he entertain audiences with his New Orleans blues band Superchief Trio, teach musical improv and host the Empire Revue, he has devoted his time to a career as a children’s performer for more than 15 years. 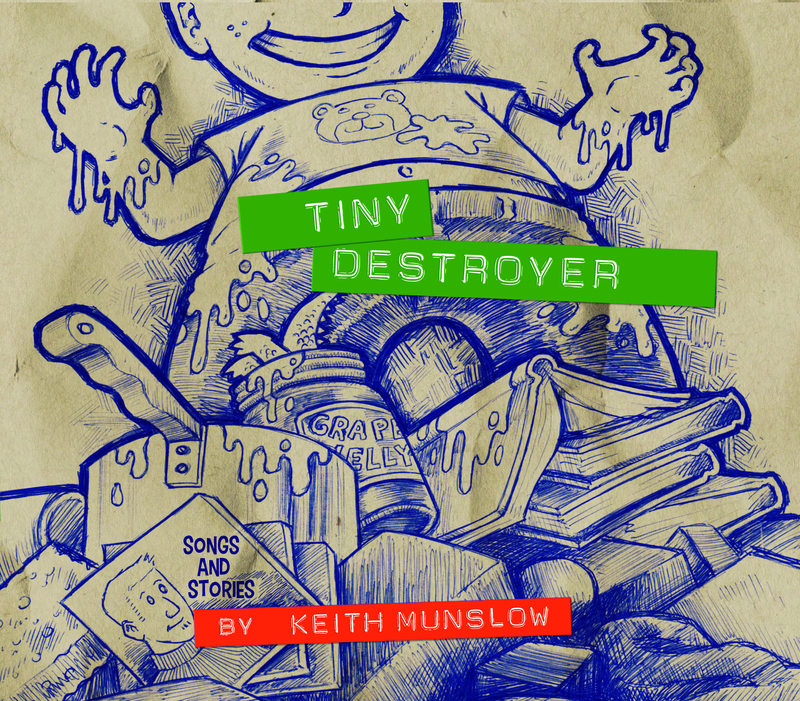 Known for his storytelling and lightning fast cartooning, two-time Parents Choice Award winner Keith Munslow has done it again by releasing his seventh children’s album, Tiny Destroyer. Tiny Destroyer, partly fueled by the new perspective Keith attained as a first-time parent to his 2-year-old son Luc, aka, the tiny destroyer, teaches the lessons of family living. I am a child at heart, but still felt it imperative to consult someone of Keith’s target audience to get their opinion. I called upon my 6-year-old nephew Benjamin. Ben’s first reaction to this CD was that he loved the illustration on the front. 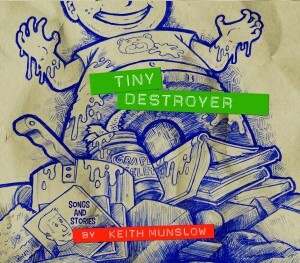 The cover art depicts a toddler stomping through the rubble of a messy house, with slime on the destroyer’s hand and just about everything else. I’m sure all parents can relate. My nephew giggled wildly when he looked inside the wallet style case and noticed an image of a cheese block with crayons stabbed into it at all angles. No doubt a stunt pulled by the child depicted on the front. We put the CD in the player and listened as we read along with each song’s little description included in the case. What stood out to me was how varied the album is; each track takes on a different genre. This album is perfect for children of all ages because it introduces them to styles that they may not have heard before and gives them a chance to explore their taste. The tracks vary from polka to rumba to ’50s doo-wop — sometimes the style changes in the middle of a song! Keith’s album also includes multiple vocabulary-building songs that teach kids and adults alike new words. Keith notes in the case that he captured his son’s giggle for the title track by dangling him in front of the microphone of their home recording studio; my nephew thought that sounded fun. Hands down, Benjamin’s favorite song was “The Last Chicken Wing,” a beautifully silly love song about really wanting the last chicken wing on the plate. It is hard to say which is my favorite track. I listen to “Princess Pepper’s Story” often; it reminds me of when I was a kid and how much I loved to listen to stories of dragons and princesses. “Magic Bike” makes my imagination run wild, taking in all the magic around us through a dreamer’s eyes on a bike ride. “Dad Is Taking A Nap” is unlike anything I’ve ever heard and drives home the age-old lesson of not waking the sleeping giant. However, “I Can Still Say ‘I Love You’” sticks out to me as one of Keith’s more personal songs; this beautiful track tells the story of the unconditional love parents will always have for their children. Containing 10 songs and two stories, Keith Munslow’s signature humor and imagination shine brighter in this new album then ever before. Benjamin and I both give it two thumbs up. This album is good fun for every family! April 3 at 10:30am; Needham Public Library, 1139 Highland Ave, Needham, Mass. 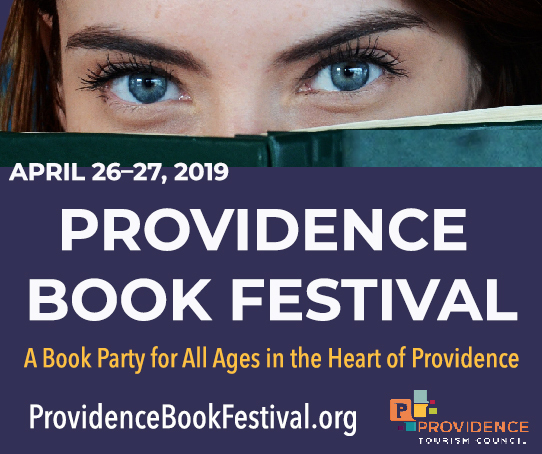 April 20 at 10:30am; Weaver Library, 41 Grove Ave, East Providence. Also keep your ears open and your radios tuned in to hear Keith do a live performance on Sirius XM Kids Place Live (channel 78) on April 24 at 11am.